On the 15th anniversary of the return of wolves to Yellowstone National Park, a quiet but profound rebirth of life and ecosystem health is emerging, scientists conclude in a new report. For the first time in 70 years, the over-browsing of young aspen and willow trees has diminished as elk populations in northern Yellowstone declined and their fear of wolf predation increased. Trees and shrubs have begun recovering along some streams, providing improved habitat for beaver and fish. Birds and bears also have more food. "Yellowstone increasingly looks like a different place," said William Ripple, a professor in the Department of Forest Ecosystems and Society at Oregon State University, and lead author of the study. "These are still the early stages of recovery, and some of this may still take decades," Ripple said. "But trees and shrubs are starting to come back and beaver numbers are increasing. The signs are very encouraging." The findings of this report, based on a recent analysis done by OSU researchers and a review of many other studies as well, were just published in Biological Conservation, a professional journal. They outline an ecosystem renaissance that has taken place since wolves were restored to Yellowstone after being extirpated in the 1920s. Along four streams studied in the Lamar River basin, 100 percent of the tallest young aspen sprouts were being browsed in 1998, compared to less than 20 percent last year. Heavy browsing by elk on this favorite food had caused new aspen tree recruitment to essentially grind to a halt in the mid-to-late 1900s, when wolves were absent, but new trees are now growing again in places. Since their reintroduction in 1995-96, the wolf population generally increased until 2003, forcing changes in both elk numbers and behavior due to what researchers call the "ecology of fear." The northern range elk populations decreased from more than 15,000 individuals in the early 1990s to about 6,000 last year, and remaining elk now have different patterns of movement, vigilance, and other traits. By 2006, some aspen trees had grown tall enough they were no longer susceptible to browsing by elk, and cottonwood and willow were also beginning to return in places. Improved willow growth is providing habitat that allows for a greater diversity and abundance of songbirds such as the common yellowthroat, warbling vireo and song sparrow. The number of beaver colonies in the same area increased from one in 1996 to 12 in 2009, with positive impacts on fish habitat. Increases in beaver populations have strong implications for riparian hydrology and biodiversity  Wyoming streams with beaver ponds have been found to have 75 times more abundant waterfowl than those without. The coyote population decreased with the increase in wolf numbers, potentially allowing more small mammals that provide food for other avian and mammalian predators, such as red foxes, ravens and bald eagles. Evidence of improved ecosystem health following the return of wolves is "becoming increasingly persuasive," the scientists said in their report, though they also note that an increasing population of bison is continuing to impact young woody plants in the Lamar Valley. 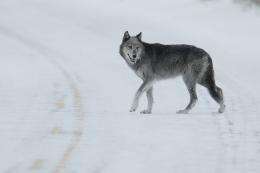 "The wolves have made a major difference in Yellowstone," said Robert Beschta, a professor emeritus of forestry at OSU and co-author on the study. "Whether similar recovery of plant communities can be expected in other areas, especially on public lands outside national parks, is less clear," Beschta said. "It may be necessary for wolves not only to be present but to have an ecologically effective density, and mechanisms to deal with human and wolf conflicts also need to be improved." But at least in America's first national park, the return of this large predator is having an impact. "Predation and predation risk associated with large predators appear to represent powerful ecological forces," the researchers concluded in their report, "capable of affecting the interactions of numerous animals and plants, as well as the structure and function of ecosystems." Are wolves saving Yellowstone's aspen trees from elk?